Another area nVIDIA received a lot of flak from end users about, with respect to the NF3-150 chipset, was the way they implemented HyperTransport. It only ran at 600 MHz and to make things even worse, the upstream connection was only 8-bits wide! In comparison, VIA's K8T800 HyperTransport moved data along at the full 800 MHz bus speed, while running on a 16-bit wide bus both up, and downstream. In theory this would mean that VIA's implementation of HyperTransport would be faster but in real world benchmarks it didn't seem to make much of a difference (though VIA did enjoy a small lead). Still, you can bet nVIDIA's competition let the world know that the nForce3-150's HyperTransport moved slower. In the server world a slower HyperTransport should be more apparent due to the higher bandwidth needs of those computers. nVIDIA silenced all their critics with the NF3-250, making certain that both Hypertransport streams (up and down) are 16 bits wide, and paced at 1000MHz instead of 800MHz. At this speed, nVIDIA has no rivals, and currently has the fastest Athlon64 platform out. While ATI focused on creating an Intel chipset, nVIDIA have been producing some pretty nice AMD chipsets for both K7 and K8 platforms - though they never seem to get it right the first time out. Nvidia were first to introduce a dual channel memory architecture for the AMD platform, and they were also first to lock the AGP/PCI bus. While the nForce3-150 had AGP/PCI locking capabilities, for one reason or another manufacturers never seemed to adopt them. 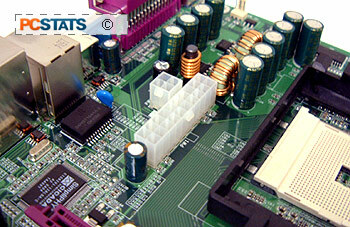 Things are different this time around; all nForce3-250 based motherboards we've tested feature functioning AGP/PCI locks. This frees up enthusiasts overclock better, and not worry about their other system components (like videocard or Serial ATA HDD's) holding them back. Perhaps it's unfair to generalize, but when it comes to AMD overclocking, we tend to expect Epox motherboards to do well.... Starting at 200 MHz, and lowering the multiplier to 8x, we began to raise the motherboard clock speed. At around 217 MHz FSB the Epox 8KDA3+ started to experience some stability problems, so up went the VDIMM to 2.8V. Unfortunately our test memory didn't want to go much past 223 MHz, but we didn't let that get the best of us. Using the 5:4 memory divider helped smooth things out, and the broke easily 240 MHz, 250 MHz and even 260 MHz! By the time the Epox 8KDA3+ reached 280 MHz, the memory started to putter out, so the 3:2 memory divider was enabled, and CPU voltage increased to 1.6V. At 287 MHz I had to raise the CPU voltage yet again, this time to 1.65V... but after that everything was nice and stable. Our overclocking adventure topped out at an amazing 290 MHz ! Not too shabby at all, eh? The only thing I can say about the Epox 8KDA3+ is that I would have liked to see mounting holes around the NF3-250 chipset as it reached elevated temperatures during testing. In fact, I think that this was probably the limiting factor in our overclocking tests.